In yesterday’s chat “Tune In: Media Saturation and Manipulation” the most interesting issues to emerge engaged not the increasing digitization and interconnectivity of modern life, but immemorial questions of form, content and community. 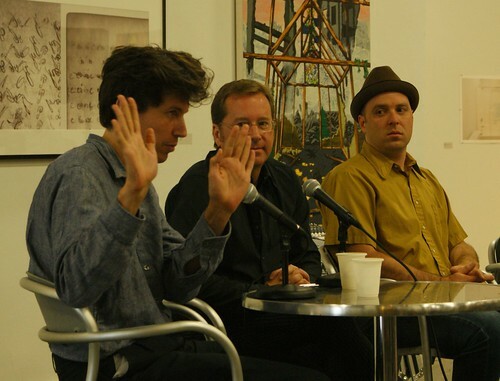 Visual artists Antoine Catala, Gregory Green and Stephen Slappe spoke with Kristan Kennedy about their use of media and technology in their respective practices. The artists first briefly rehearsed the main thrust of their projects in this year’s festival. Catala’s media “blobs” objectify a live television feed into anthropomorphically-scaled projected sculptures. Green provides a “direct media intervention” in the form of a pirate radio station installed in a gallery and open to un-curated participation. Finally, Slappe’s web-based project uses the internet as both an active and standard archive, inviting Halloween-costumed participants to join his eerie “legion.” The conversation, representing the full range of radio, television and internet, hovered between optimism and pessimism, as well as fascination, hope and deep mistrust. A major theme of the chat was the evolving relationship between the forms of media, and the concomitant stances available to the viewer. Catala pointed out that while TV implied a communal audience, the internet engenders a more narcissistic experience, calibrated to individual timing, and encompassing both text and comment/response. Of course this isn’t uncharted territory, as Slappe noted, his project hinges on the familiarity and cinematic sense of the medium. Issues of boredom, interest, seduction and discovery–very much related to spectatorship in art–were woven throughout their dialogue. For both Catala and Green, the misuse of technology and information were of particular interest. In the former case, this is evident in an interest in mobilizing glitches for conceptual or aesthetic purposes, and in the latter case an interest in pushing a form’s limits in the register of legality. These issues have been well-rehearsed and what was batted around in the chat hardly shed new light on art’s exploration of our changing media-landscape. As one panelist remarked, it is the generation who has not yet started making art on the global stage, born in the 90s, that will make the defining work in this regard. That being said, the panelists were perfectly matched, and their intersecting interests and divergent practices made for a very organic conversation. Ancillary issues of community, participation, form and content were touched upon meaningfully in each artist’s discussion of his own practice and his understanding of available technology. Catala espoused a sort of morbid fascination with television as a dying medium, and the artist’s role in submerging himself into it’s last gasps in order to provide a fitting requiem. This experimental stance towards technology directly relates to his choice of content–the news stream, the 24/7 webcam–tropes seemingly endemic to, and exemplary of, their respective media. This determined coupling, however, is colored by a reverence for traditional painting and fascination with humanity’s uncanny relationship with it’s own image. While his project does not require literal participation by the viewer, it certainly engages with the theatricality of both minimalism and cinema, creating a phantasmic encounter that is active even in it’s staging of passivism. On the other hand, Green’s project takes up an outmoded medium, which nonetheless is still used in the much the same manner as ever, and opens it to radical democratic participation. However, this type of form and content flirts with politics of disappearance and esoterica; while the project requires literal participation, rather than spectatorship, it is not clear that the resulting content will be accessible or relevant. Finally, Slappe’s project utilizes the form of the internet mostly as a matter of practicality–ease, speed, storage and widespread accessibility–apparently not due to an internal necessity of the type of images he is gathering or putting forth. That being said, it turns out that the participation that is the lynchpin of the project also affects its own erasure, or anonymity, in a way that is quite typical of the medium. Taken together, the mass of individual avatars become meaningful as an aggregation, a horde defined by, and only by, its very multitude and sociality. The visions of community offered by each respective project include passive spectatorship (which is nonetheless weirdly engaging), active participation (which in strangely disjointed) and individual representation (which is uncannily incorporated). The complexity of each engagement results in part from the artistic will to push technology to the limit, to test boundaries and to exploit flaws where they are found.